M+B is pleased to announce Neverland Lost, the premier exhibition of color photographs by Henry Leutwyler. 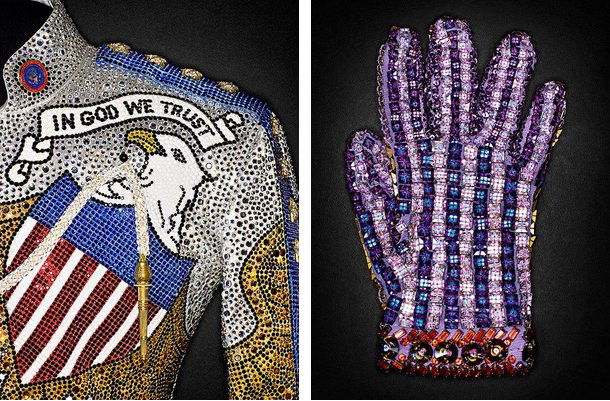 In stark objectivity, Neverland Lost examines the Michael Jackson myth through portraits of personal items and pieces of his stage costumes—like the iconic sparkling glove—that were removed from Jackson’s Neverland Ranch and intended for auction. There will be an opening reception for the artist on Thursday, June 10 from 6 to 8pm and a book signing for Leutwyler’s newly released monograph by Steidl titled Neverland Lost on Saturday, June 12 from 2 to 4pm. The exhibition will run from June 10, 2010 to August 14, 2010. Through the cool, documentary scrutiny of Leutwyler’s lens, the taxonomic portraits give a glimpse into the inner turmoil of a man caught between the public persona of one of the greatest entertainers of all time and his troubled and sequestered private life. The famous sparkling socks that peeked out from glittery shoes turn out to be ordinary white tube socks decorated with rhinestones. Sequined shirts decked out with sashes and epaulets bear traces of makeup and sweat. Perhaps for the first time, we see their mundanity. But as demystifying and unsentimental as these portraits may be, in Neverland Lost Leutwyler creates a catalogue of images that are almost too intimate to behold. Henry Leutwyler is an internationally acclaimed photographer born in Switzerland and based in New York. His work has appeared in the New York Times Magazine, Vogue, Esquire and Vanity Fair. In 2008, Leutwyler was the recipient of the ASME Magazine Cover of the Year award and recognized as the Graphis magazine Photographer of the Year. His work has also received acclaim from the Art Directors Club of New York, The Society of Publication Designers, Photo District News, D&AD, American Photography and the James Beard Foundation. M+B is pleased to present Jones Beach, an exhibition of black and white photographs by Joseph Szabo. Images of tanned muscle men, catwalk-like displays of beach wear, heavily oiled skin, masses of sprayed hair, and all the pageantry of adolescence reveal the dynamics of a beach that was a true melting pot of humanity. There will be an opening reception for the artist on Thursday, June 10 from 6 to 8pm and a book signing for Szabo’s newly released monograph by Abrams Books with introduction by Vince Aletti titled Jones Beach, on Saturday, June 12 from 2 to 4pm. The exhibition will run from June 10, 2010 to August 14, 2010. Somewhat of an expert on the subject of teenagers with his previous works Almost Grown and Teenage, Szabo began shooting at Jones Beach one summer when his usual subjects – his photography students from Malverne High School – were no longer readily available. He chronicled the public and the private lives displayed on this ocean playground that is one of the world’s busiest beaches. Even if we weren’t there to enjoy the good weather and excellent people watching we have these photographs, which turn a captive eye to the urban masses who came out to celebrate their weekends, holidays and summers. Jones Beach reveals the forces in motion at such a theater of humanness, from moments of quiet introspection to flashy exuberance. Called the “people’s palace by the sea”, Jones Beach is still a unique space very different from the commercial appeal of Coney Island or the privileged seclusion of the Hamptons. On this democratic stretch of sand and ocean class, race, and other potential divisions were temporarily forgotten and Szabo’s sympathetic lens was there to capture it all. Joseph Szabo is an internationally acclaimed artists whose previous bodies of work have influenced and been admired by an entire generation of photographers, directors and taste makers. Szabo was born in Toledo, Ohio in 1944. He studied photography at the Pratt Institute where he received his MFA in 1968 and went on to teach photography at Malverne High School in Long Island and at the acclaimed International Center of Photography in New York City for over 20 years. His work can be found in the permanent public collections of the Metropolitan Museum of Art (New York), Museum of Modern Art (New York), Yale University (Connecticut), International Center of Photography (New York) and the Bibliotheque Nationale in Paris, among others. This is Joseph Szabo’s second exhibition with M+B. For further information, please contact Shannon Richardson at 310 550 0050, shannon@mbart.com, or visit our website www.mbart.com.